India’s official name is Bharat and this is accorded equal primacy as the word India in the Constitution. In fact the First Clause of the Constitution begins with the words: India, that is Bharat,…. In Sanskrit, ‘Bha’ means Light and Knowledge while ‘rata’ means “Devoted”. 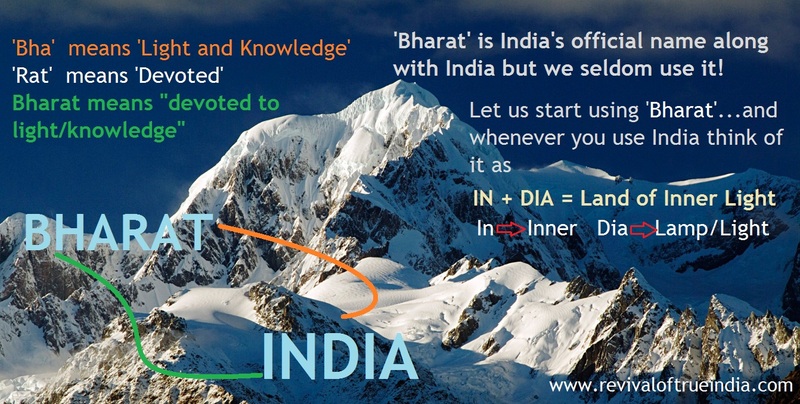 Bharat means "devoted to light/knowledge". The name "Bharat" is symbolic in nature revealing the quest of knowledge and the spiritual/scientific prosperity of this country. Through the ages our ancestors referred this land as Bharat. Though the name ‘Bharat’ should be used, we seldom use it today! Why not refer India as In + Dia = India ==> The Land of Inner Light analogous to its original name Bha + rata = Bharat ==> meaning devoted to light and knowledge ? If you are using India, refer or think of it as In + Dia (The Land of Inner Diya) retaining the glory of its name in the modern name ‘India’ rather than just ‘India’ as ascribed by others. According to the Puranas, this country is known as Bharatavasha after the king Bharata Chakravarti. It is clearly stated that this country is known as Bharata Varsha. The realm of Bharata is known as Bharātavarṣa in the Mahabhārata (the core portion of which is itself known as Bhārata) and later texts. The term varsa means a division of the earth, or a continent. According to Mahabharata as well as the numerous puranas and diverse Indian history, Bharat Empire included the whole territory of the Indian subcontinent, including parts of present day Pakistan, Afghanistan,China, Iran, Tajikistan, Uzbekistan, Kyrgyzstan, Russia, Turkmenistan, North-west Tibet,Nepal and Bangladesh. Hindustan, as is the term Hindu itself, entered the English language in the 17th century. In the 19th century, the term as used in English referred to the northern region of India between the Indus and Brahmaputra rivers and between the Himalayas and the Vindhyas in particular, hence the term Hindustani for the Hindi-Urdu language.Hindustan was in use synonymously with India during the British Raj. In the words of Dr Frank Morales, the term “Hindu” is not a term that is inherent to the religion itself. Rather, the term is known to have been first coined by the ancient Persians, who were culturally, religiously, and perspectively extrinsic to the culture. The term was first used by these ancient Persians in order to conveniently designate the ancient Vedic spiritual culture, and was mistakenly used to refer to the Vedic religion as primarily a geographic and ethnic phenomenon, more than as a religio-philosophical world-view.To the ancient Persians, the word Hindu simply referred to the culture, people, religion and practices of the peoples who lived on the other side of the Sindhu River. In the ancient Avestan Persian language ‘s’ grammatically became ‘h’. Thus, the Persians pronounced the name of this river Hindhu, rather than Sindhu. Thus, ironically, the currently used word Hindu is itself a corruption of the Persian word Hindhu, which is in turn a corruption of the term Sindhu, which is itself only referring to a river, and not a religion! Thus when the word Hindu is used today to refer to the ancient religion of India, the term is in actuality a corruption of a corruption of a word whose meaning is irrelevant to begin with. "The land created by the gods which stretched from the Himalayas to the Indu (i.e. Southern) ocean is called Hindusthan, with the हिंदु (Hindu) mentioned in word हिंदुस्थानं (Hindusthan)." Most experts agree today that the name India was derived from the river Indus (in today’s Pakistan). But where did the name ‘Indus’ come from? In ancient times, the entire Indus river system (along with its seven tributaries – Chenab, Ravi, Sutlej, Jhelum, Beas and the now extinct River Saraswati) and the area it covered, used to be called Sapta Sindhu i.e. the land of seven rivers (Sindhu means river in Sanskrit). The word Sindhu not only referred to the river system and adjoining area but also became the label to denote the culture that had developed along its valleys. Thus to world beyond, the area around the Saraswati-Sindhu rivers and its culture became to be known as the area of Hindus(thus the name Hindustan which literally means the land of Hindus). About 2500 years ago, when the Greeks first reached the river plains of Punjab, they borrowed the name of the region from the Persians and simply modified it to Indos. Indos later morphed into Indus in Latin by which name the river is still known in the West. The Romans began to call the whole land mass after this river and thus the name India came to stay which has been the form used by Europeans over the ages. The ancient Greeks referred to the Indians as Indoi (Ινδοί), which translates as "the people of the Indus".